We all know that crowdfunding is inspiring innovation across many sectors both technical and not so technical. We’ve seen some great wearable technology, mobile apps, games and even a really cool phone case or two. One sector that’s really benefited from the crowdfunding explosion is photography. Just yesterday we reported on Otto a new physical camera with smartphone camera features including filters and the ability to capture animated gifs on the camera itself. Today we’ve come across an amazing 360° camera, in fact it’s the first full hd 360° camera in the world. 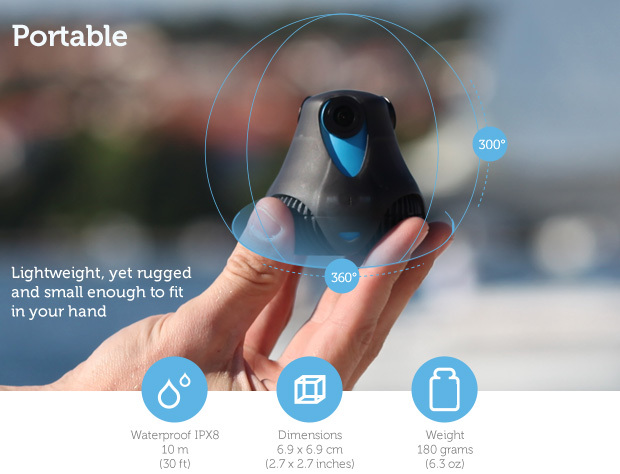 The 360° cam by Giroptic is the first ultra high definition camera that breaks through the barriers of the frame and captures what’s going on up, down and all around. It does this with an amazing set of technology working together in an incredibly small, portable body. The 360°cam is also equipped with a GPS sensor, gyroscope, microphones, wifi, microSD, microUSB and more making it both extremely easy to use to shoot with and just as easy to output. You can even mount it to a monopod on top of your car and create your own Google Street View experience, but actually much clearer than Google’s. Just how does the 360cam take the pictures and video? You can pre-order your 360cam by Giroptic here via Kickstarter. The applications for technology like this are endless.